1. Please plug the power cord into the amp THEN the wall, plug the audio cables into amp THEN switch on. Some customers may see some slight sparks flying when they plug the power supply into the amplifier, because they use it in wrong way, you need to connect the amp to the power supply first, then plug the power supply into the 110v AC outlet, don't worry about the sparks, because this is class d amplifier, the capacitors need to charge when the power in, it's normal and safe. 2. The amp will off when you switch off, but it's normal that the power LED light stay on even switch off, the power LED light on means the power supply in. 3. What will cause noise? Poor quality audio cables, Sound source, Speakers, Other interfering signals;Incompletely connections. 4. How to judge whether the noise from the amplifier? Unplug the RCA cable, connect this amp to speakers, and then plug into the power supply, power on and volume on, hear whether noise exists on speakers, if noise existed, the noise may from speakers or amp, so you need to change speakers for further confirmation. If no noise the noise may from the audio source. With Bass and Treble Control version: B076P2VS9H . 10. Supplied Accessories: Amplifier, Power supply, AC power cord, Manual. Adopt Texas Instruments TDA7498E chip to get clear audio sound, No pop, no audible noise, dead silent when nothing is playing through it. 160W X 2(4 ohms, 20 Hz - 20 kHz, 0.04% THD), for outdoor/ bookshelf/ computer/ desktop /ceiling /floor standing speakers, can use iPod, Phone, MP3 players, TV, Echo Dot, CD players, or Streaming Media players as input. 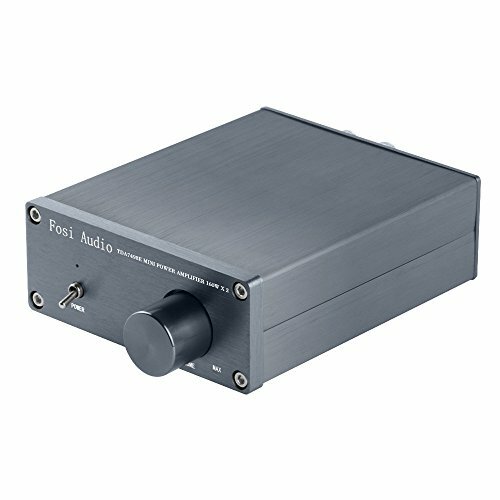 If you have any questions about this product by Fosi Audio, contact us by completing and submitting the form below. If you are looking for a specif part number, please include it with your message.